THIS FOLDER HAS BEEN COMPILED FOR YOUR SPECIAL BENEFIT. IT WILL TELL YOU HOW TO SEE THE MANY BEAUTIFUL AND INTERESTING PLACES IN AND AROUND ST. PAUL AND MINNEAPOLIS MOST COMFORTABLY, QUICKLY, AND INEXPENSIVELY. WHERE TO GO? HOW TO GO? HOW MUCH WILL IT COST? YOU'LL FIND IT ALL TOLD HEREIN. PERHAPS WE WOULD BETTER SAY: "HERE'S A SERIES OF MAPS AND HINTS TELLING HOW TO ENJOY SIGHTS AND SCENES NOT RIVALED, IN MANY RESPECTS, IN ALL AMERICA. IT'S A FRESH-AIR GUIDE TO THE TWIN CITIES OF MINNESOTA, WHERE THERE IS ALWAYS TONIC IN THE AIR AND WINE IN THE WINDS—WHERE IT'S A JOY TO BE ALIVE." 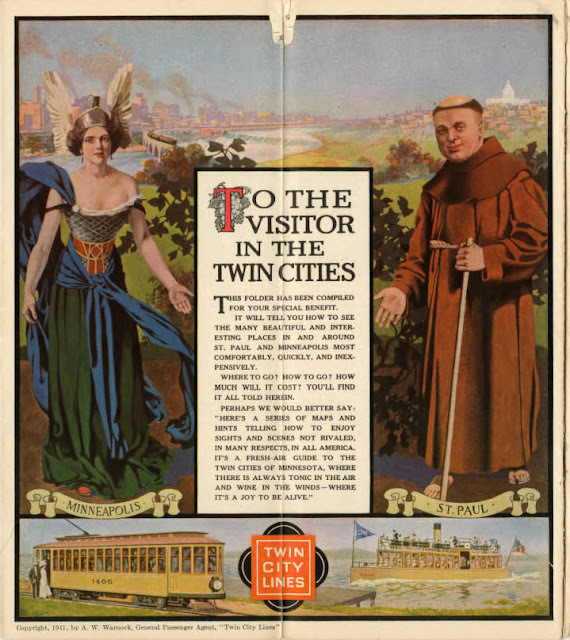 Copyright, 1911, by A. W. Warnock, General Passenger Agent, "Twin City Lines"
I think it's funny/cool that in 1911 the city of Minneapolis was pictured as a winged pseudo-Greek goddess and St Paul was a journeying tonsured monk. Looks like their preferred means of transportation was a streetcar. You can page thru this charming booklet at Minnesota Reflections.